Spirits Soar as UCSF Marks Construction Milestone at Mission Bay Medical Center with "Topping Out"
Mark Laret, chief executive officer of UCSF Medical Center and UCSF Benioff Children's Hospital, watches while San Francisco Supervisor Malia Cohen signs the beam to be placed atop the new medical center complex at Mission Bay. Much has been said and written about the UCSF Medical Center at Mission Bay, a $1.5 billion project years in the making that will result in San Francisco’s first new hospital in decades. Some people point to the facility’s high-tech features and environmentally sustainable design; others to the collaborative environment that will result from the placement of specialty hospitals for children, women and cancer patients just steps away from UCSF’s 42.5-acre biomedical research and teaching campus. 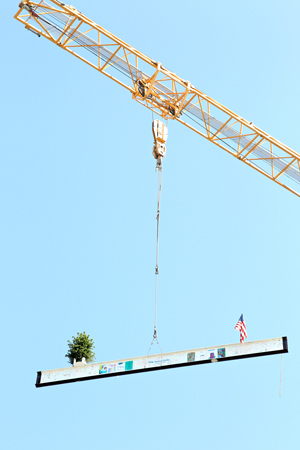 A 1,600-pound beam is placed atop the new hospital complex, signifying the end of the structural steel phase of San Francisco’s first new hospital in decades. The 29-foot white beam was installed Oct. 17 as part of a “Topping Out” Celebration to mark the end of the project’s structural steel phase, as a crowd of hundreds of construction workers and project supporters looked on. The event — a tradition in building construction — was an opportunity to recognize and thank the massive team that contributed to the design and initial construction of the 878,000-gross-square-foot facility. When it opens in early 2015, the 289-bed medical center will set a new standard for patient- and family-centered health care, safety, sustainability and translational medicine. Weighing in at 1,600 pounds, the symbolic beam represents just a fraction of the 9,272 tons of steel that will comprise the hospital complex. In addition to messages and signatures from UCSF staff, patients, donors, and construction workers, the beam was decorated with artwork by adult and pediatric patients, an American flag, and a small, live tree symbolizing “good luck and hope for the future,” Lima said. Under sunny autumn skies, the event culminated in a picnic-style lunch at the construction site where donors in suits mingled with workers sporting hard hats and bright yellow and orange safety vests. One of those workers was Ron Morris, a 28-year veteran of the ironworking industry who has attended more topping out ceremonies than he can count. But the medical center event stood out, he said. “It’s nice to see something here like this (facility) — the good it’s going to do,” said Morris, whose crew of two dozen welders arrived at the site in mid-May. 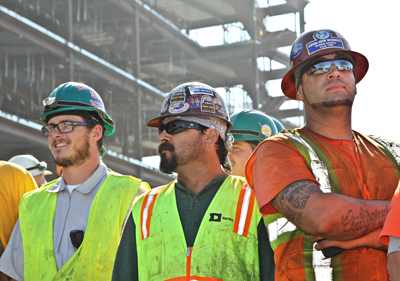 Fellow ironworker Darrell Moore said the medical center was a welcome job creator and a hopeful sign at a time when many large-scale construction projects lack the funding to get off the ground. 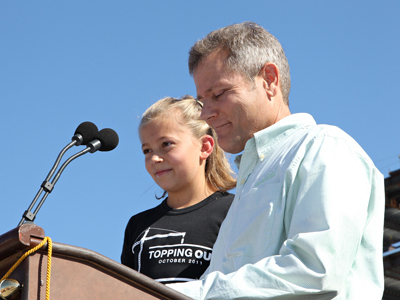 Unlike Morris and Moore, some guests at the topping out celebration hadn’t visited the site in a while and seemed amazed by how it had evolved since the initial groundbreaking almost exactly a year ago. 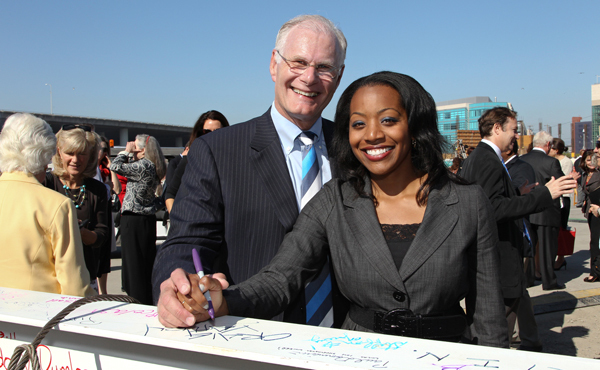 Sarah and Herb Moussa took part in the “Topping Out” Celebration, a tradition in building construction, at the emerging UCSF Medical Center at Mission Bay. Project architect Herb Moussa attended the celebration with his 11-year-old daughter Sarah, who spent nearly two weeks at UCSF Benioff Children's Hospital last year after developing a relatively uncommon condition known as periorbital cellulitis, which caused dangerous swelling in her brain and a seizure that left her unconscious. "I'm here today not as an architect, but as a father," said Moussa, who works for the San Francisco-based firm Anshen + Allen, owned by Stantec. "I get it now. I know what this building is about." Moussa described the anticipation of the medical center's opening day to "waiting for someone to open an amazing gift, and you already know what's inside." Adler noted that the medical center was designed to achieve optimal patient safety through features such as ceiling-mounted patient lifts in each of the cancer hospital’s 70 intensive care unit patient rooms. Hundreds of construction crew members, ironworkers and others who have helped erect the skeleton of the 878,000-gross-square-foot building gathered for a ceremony and lunch on Oct. 17. Despite the economic downturn, UCSF already has raised $325 million of its $600 million fundraising goal. In March 2009, The Atlantic Philanthropies and its founder Charles F. Feeney made a $125 million matching gift, followed in June 2010 by a $100 million private donation from Lynne and Marc Benioff to the children’s hospital that now bears the Benioff name.